Until recently high precision micro cutting has been the domain of DPSS Pulsed Lasers and CW-M Fiber Lasers, as epitomised by applications such as electronic stencil and medical stent cutting. However, the short high peak power pulses of our redENERGY Pulsed Fiber Lasers are proving to be ideally suited to cutting a wide range of thin <1mm section materials both metals and non metals. This application insight explores this surprising application area, looking primarily at metallic materials such as steel and aluminium, it demonstrates the different cutting strategies and techniques that can be applied with the Pulsed Fiber Laser, focusing on the beam wobble and cut line off-setting techniques. Micro cutting with nanosecond Pulsed Fiber Lasers is a relatively new but growing application area. 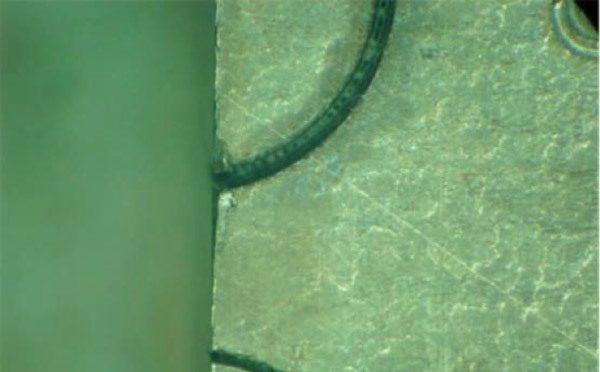 Rather than a melt and blow process requiring a fixed optical arrangement and an assist gas nozzle assembly, the process is primarily vaporisation driven, using a scanner based beam delivery arrangement with no cutting gas nozzle, resulting in burr free cutting with minimal heat affected zones. The vaporisation cutting process relies on an incident power density that will achieve a predominantly vaporisation response from the material. Although a small spot size is a key attribute of the process it is not the only beam characteristic that needs to be considered. Table 1. Effect of F-Ø focal length and beam quality on calculated spot size (µm) based on 8mm beam diameter. Although beam quality is often defined by the M2 value the impact of the beam related characteristics are far broader. M2 has a direct correlation to the spot size, however, pulse characteristics such as the pulse energy, peak power and duration also have a significant bearing on the process. 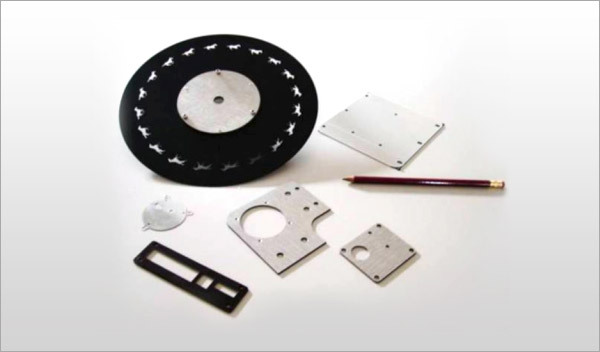 At SPI Lasers all of our redENERGY Pulsed Fiber Lasers can be used effectively for Laser cutting, but exhibit slightly different cutting characteristics and source selection is dependant of the material and the desired output. For example, for very narrow kerf widths the SM is best suited, while for thicker materials the HM generally produces better results (table 2). An example of the difference in performance can be shown when cutting through painted sheets. A comparison of similar cuts made using identical optical arrangements using a 20W SM and a 40W HM Laser showed that both Lasers could cut the 1mm hole to the high tolerance required but the high beam quality SM Laser did far less damage but cut at a low speed, the HM Laser put more energy into the process resulting in significantly higher cutting speed but showed some damage to the paint (figure 1). This cutting technique is based on a sequence of overlapping pulses. Using the vaporisation process the typical pulse event is the formation of a crater whose size and shape of dependent on the incident energy characteristics. Typical removal rates can be in the range of 1-50microns for a single pass. The motion speed and the pulse frequency govern the amount of overlap achieved. For cutting a high level of overlap is generally required, but too high an overlap can reduce the material removal efficiency. This varies with optical characteristics and the material being processed and so requires some initial optimisation. 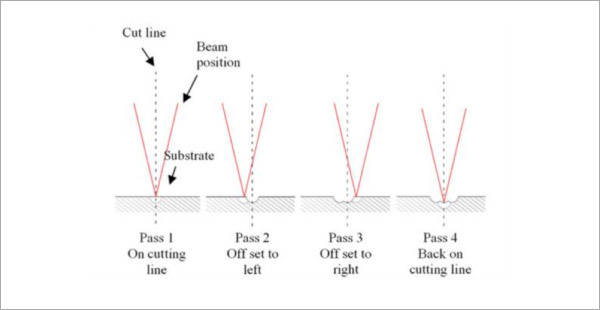 Fine foil cutting <50µm may just require a single pass, however, in the case of thicker materials multiple passes are required to achieve full penetration through the material. For thin materials <200µm a relatively simplistic process can be adopted where the passes are coincident and each pass follows the exact same trajectory and uses the same conditions. However, for thicker materials beam attenuation results in a reduction of processing efficiency. Adjustment of the focal position during cutting can improve the situation, but yields only marginal benefits. To be able to cut thicker materials using scanner based systems some novel cutting strategies need to be adopted that effectively widen the kerf. To some extent this can be addressed by using an appropriate spot size through selection of FL and beam diameter, but this also reduces the incident power density which effects the vaporisation efficiency to a point where a threshold is reached at which there is no significant material removal. One technique that can be effectively used to widen the kerf is to apply a “wobble” to the beam such that the beam is effectively spiraling and a pre-defined amplitude along the cutting line. This is a common feature in marking software and is extensively used to broaden line width when part marking (figure 2,3). Figure 2. Arcs cut showing effect of increased kerf width resulting from beam wobble (top) vs no wobble (bottom). Figure 3. Schematic comparing a simple cutting with beam wobble technique. Care needs to be taken in the programming to ensure that the finished part has acceptable finished dimensions. One point to note is that on the thicker materials there can be a noticeable taper on the cut edge ~2-3°. Figure 4. Schematic of sequential steps in off-set cutting. This cutting process can be applied to a wide variety of materials ranging from ferrous and non ferrous metals to ceramics, polymers and carbon composites. The cutting speeds that can be achieved vary quite considerably from >10 m/min for thin foils to <10mm/min for thick >1mm materials. Compared to conventional Laser cutting these speeds may be slow but for many applications the low capital cost and the flexibility offered by ns Pulsed Fiber Laser cutting/marking systems are highly attractive. Figure 5. Cut samples; 1.2 mm aluminium sheet, 0.2 mm tinned steel sheet 0.5 mm & 2.0 mm anodised aluminium – Courtesy of Newson Engineering NV.